1. Ovid (1st c. BCE and CE), Tristia 2.361-376. Translated by A. L. Wheeler. Revised by G. P. Goold. Moreover, not I alone have written tales of tender love, but for writing of love I alone have been punished. What but the union of love and lavish wine was the teaching of the lyric muse of the aged Tean bard [=Anacreon, 6th c. BCE]? What did Lesbian Sappho teach the girls if not love? Yet Sappho was secure, the Tean also was secure. It did not injure thee, scion of Battus [=Callimachus, 3rd c. BCE] that thou didst often in verse confess to the reader thy wanton pleasures. No play of charming Menander [4th/3rd c. BCE] is free from love, yet he is wont to be read by boys and girls. 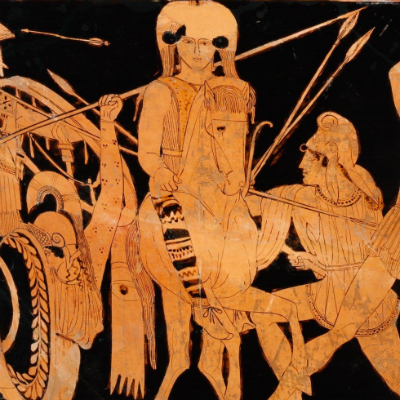 The very Iliad—what is it but an adulteress about whom her lover and her husband fought? What occurs in it before the flaming passion for Briseis and the feud between the chiefs due to the seizure of the girl? What the Odyssey except the story of one woman sought in her husband’s absence for love’s sake by many suitors? 2b. Fresco from the north interior wall of the Macellum in Pompeii c. 65 CE. Thought to depict Penelope and Odysseus as beggar (cf. Odyssey 19.51-360). 2c. Ovid, Heroides 1.1-12. Translated by Grant Showerman. Revised by G. P. Goold. These words your Penelope sends to you, O Ulysses, slow of return that you are; writing back is pointless: come yourself! Troy, to be sure, is fallen, hated of the daughters of Greece; but scarcely were Priam and all Troy worth the price to me. O would that then, when his ship was on the way to Lacedaemon, the adulterous lover had been overwhelmed by raging waters! Then had I not lain cold in my deserted bed, nor would now be left alone complaining of slowly passing days; nor would the hanging web be wearying now my widowed hands as I seek to beguile the hours of spacious night. When have I not feared dangers graver than the real? Love is a thing ever filled with anxious fear. Whoso turns to these shores of ours his stranger ship is plied with many a question ere he go away, and into his hand is given the sheet writ by these fingers of mine, to render up should he but see you anywhere…[1.66] In what lands are you abiding, or where do you idly tarry? Better for me, were the walls of Phoebus still standing in their place—ah me inconstant, I am wroth with the vows myself have made! Had they not fallen, I should know where you were fighting, and have only war to fear, and my plaint would be joined with that of many another. But now, what I am to fear I know not—yet none the less I fear all things, distraught, and wide is the field lies open for my cares. Whatever dangers the deep contains, whatever the land, suspicion tells me are cause of your long delay. While I live on in foolish fear of things like these, you may be captive to a stranger love (peregrino captus amore potes, 1.76)—such are the hearts of you men! It may be you even tell how rustic a wife you have—one fit only to dress fine the wool. May I be mistaken, and this charge of mine be found slight as the breeze that blows, and may it not be that, free to return, you want to be away! Let him chide on — yours I am, yours must I be called; Penelope, the wife of Ulysses, ever shall I be. Yet is he bent by my faithfulness and my chaste prayers, and of himself abates his urgency. The men of Dulichium and Samos, and they whom high Zacynthus bore—a wanton throng—come pressing about me, suing for my hand. In your own hall they are masters, with none to say them nay; your goods, my very life, are being pillaged. Why tell you of Pisander, and of Polybus, and of Medon the cruel, and of the grasping hands of Eurymachus and Antinous, and of others, all of whom through shameful absence you yourself are feeding fat with store that was won at cost of your blood? As for myself, who when you left my side was but a girl, though you should come straightway, I surely shall seem grown an aged dame. 3. Ovid, Heroides 10.1-16. Go back and reread Catullus 64. Gentler than you I have found every race of wild beasts; to none of them could I so ill have trusted as to you. The words you now are reading, Theseus, I send you from that shore from which the sails bore off your ship without me, the shore on which my slumber, and you, so wretchedly betrayed me—you, who wickedly plotted against me as I slept. ’Twas the time when the earth is first besprinkled with crystal rime, and songsters hid in the branch begin their plaint. Half waking only and languid from sleep, I turned upon my side and put forth hands to clasp my Theseus—he was not there! I drew back my hands, a second time I made essay, and o’er the whole couch moved my arms—he was not there! Fear struck away my sleep; in terror I arose, and threw myself headlong from my abandoned bed. Straight then my palms resounded upon my breasts, and I tore my hair, all disarrayed as it was from sleep. 4. Dani Bostick (@danibostick), “The Voice of the Heartbroken.” In Medias Res. Nov. 20 2018. 5c. Raphael’s fresco Parnassus in the Stanza della Segnatura at the Vatican. Image: Wikimedia. The god Apollo, seated at the centre, plays the lyre surrounded by the nine Muses, and by ancient and modern poets, among whom Homer (blind), Virgil and Dante are easily recognisable behind him, as well as the poetess Sappho seated at the bottom left, with her name written on the scroll she holds in her left hand. 6a. Ovid (? ), Heroides 15.1-12. Translated by Grant Showerman. Revised by G. P. Goold. Tell me, when you looked upon the characters from my eager right hand, did your eye know forthwith whose they were—or, unless you had read their author’s name, Sappho, would you fail to know whence these brief words come? Perhaps, too, you may ask why my verses alternate, when I am better suited to the lyric mode. I must weep, for my love —and elegy is the weeping strain; no lyre is suited to my tears. I burn—as burns the fruitful acre when its harvests are ablaze, with untamed east-winds driving on the flame. The fields you frequent, O Phaon, lie far away, by Typhoean Aetna; and I—heat not less than the fires of Aetna preys on me. Neither the maids of Pyrrha charm me now, nor they of Methymna, nor all the rest of the throng of Lesbian daughters. Naught is Anactorie to me, naught Cydro, the dazzling fair; my eyes joy not in Atthis as once they did, nor in the hundred other maids I loved here to my reproach; unworthy one, the love that belonged to many maids you alone possess. If nature, malign to me, has denied the charm of beauty, weigh in the stead of beauty the genius that is mine. If I am slight of stature, yet I have a name fills every land; the measure of my name is my real height. If I am not dazzling fair, Cepheus’ Andromeda was fair in Perseus’ eyes, though dusky with the hue of her native land. Besides, white pigeons oft are mated with those of different hue, and the black turtledove, too, is loved by the bird of green. If none shall be yours unless deemed worthy of you for her beauty’s sake, then none shall be yours at all. Yet, when I read you my songs, I seemed already beautiful enough. 7. P. Oxy. 1800 fr. 1, Oxyrhynchus papyrus (late 2nd or early 3rd c. CE). Sappho was a Lesbian by birth, of the city of Mytilene. Her father was Scamander or, according to some, Scamandronymus, and she had three brothers, Erigyius, Larichus and Charaxus, the eldest, who sailed to Egypt and associated with one Doricha, spending large sums on her; Sappho was more fond of the young Larichus. She had a daughter Cleis, named after her own mother. She has been accused by some of being irregular in her ways and a woman-lover. In appearance she seems to have been contemptible and quite ugly, being dark in complexion and of very small stature. The same is true of (Alcaeus?) who was smallish . . .